Tech weirdness on travel, what gadgets we used and didn’t use. ChargeDr from Digital Innovations to help me charge my devices, and OmniGraffle in the Mac App Store saves my sanity in making my Travel Diagram of Doom. Interviews from the CSUN Persons With Disabilities Expo include Big Grips Frame from biggrips.com, sComm UbiDuo for the hearing impaired from scomm.com and the WHILL super cool looking, off roading, wheelchair from whill.jp. In Chit Chat Across the Pond I interview Dr. Robert Carter, Allison Hartley, and Shelly Brisbin about the enhancements in iOS 7.1 for the visually impaired and blind. Hi this is Allison Sheridan of the NosillaCast Mac Podcast, hosted at Podfeet.com, a technology geek podcast with an EVER so slight Macintosh bias. Today is Sunday March 23, 2014 and this is show number 463. So how awesome were our three guest hosts while we were gone? Steve and I had a blast listening to the shows. Bart did a fantastic job of explaining the Goto Fail bug. On the trip we were talking to some programmers and I was able to explain in just a few sentences what had gone wrong. I felt fully informed even though I couldn’t program in C if you put a gun to my head. David Allen’s contribution of the Sony NEX 6 Camera was fantastic – has me really thinking about switching from a DSLR. Here I was lugging my 26 pound DSLR around in my purse on 12 flights in 24 days, hiking, out to dinner…and then here’s David talking about how nice and light and small the NEX 6 is AND takes awesome photos. I sure am tempted! In Chit Chat Across the Pond I loved the discussion with Antonio Rosario about photography. He has south a gentle and patient teaching style, combined with passion and enthusiasm. He also throws in a hint of a rant here and there which adds flavoring. I’m thrilled that he’s going to do a video series on Switch to Manual. I’m getting more and more comfortable with being off program mode, even doing a bit of shutter priority on the trip! Great job by Bart and Antonio. Now let’s talk about Katie. How COULD she have my arch nemesis, Chuck Joiner, on the show? Imagine my dismay when I found the “Chuck was here” post-it in my medicine cabinet when I got home? In all seriousness, I thought the two of them did a great discussion on what a video animal Chuck is! Steve and I cover Macworld in video too – but if we do a dozen videos to Chuck’s 60 I’d have to be exaggerating, and we’re exhausted after that! Steve and I really enjoyed their discussion. I have a plan for some time in the future to have Steve and Chuck on together to talk about the gear they use. I got the idea because the two of them go nuts talking to each other at every show about every new little gadget/enhancement they’ve figured out, and when we walk the show floor Steve is constantly being asked questions about his rig. Should be fun, but I think it would be good to space it out a ways from Macworld. Rounding out the three shows with Allister was perfect. We had a great time meeting up with him in Wellington. We met him for lunch when we first got there, and he gave us the local SIM card for the Mifi. We had to do some work to configure it and he helped me the whole way. It worked GREAT, by the way. We used hotel wifi as much as we could and almost made it through the whole NZ part of the trip with just the 3GB he bought us. Luckily he also showed us how to top it off so another purchase of 1.5GB got us through the trip. He was also invaluable on our inter-island flights. He’s a bit of an airplane nerd (I’d venture to say he has an EVER so slight inclination that way) so he tracked all of our flights while we were there. So we’re sitting in the Wellington airport waiting for our flight to board to go to Queenstown, when he pings me that our flight has been canceled. I assured him he was wrong as we’d just seen the crew board and passengers were lining up to board. However, unbeknownst to us, the airline had canceled our flight AND booked a completely different flight through this same gate! Why would WE have a need to know??? Anyway, when we came back through Wellington he picked us up at the airport, took us to the beach for some traditional fish and chips, drove us around the bays and had dinner with us. It was delightful! His version of the NosillaCast was great too. We loved Dorothy’s view of the Watershot Underwater camera housing for iPhone, including the image she painted of the reactions of her brother-in-law being able to flip his phone to Marc before landing in the drink. I know Dorothy in real life and while she’s not as big of a klutz as me, she just might not have made that work. Bart did a great job of setting up the problem to be solved that his IcyDock disk caddy solves. I use an IcyDock enclosure for my main backup drive and it’s always been rock solid. We have a couple of these drive toasters from Tim’s estate and they work ok, but the IcyDock sounds much better. I had NO idea we could install fonts on our iOS devices (must have missed that G+ link), so learning about that from Allister was really cool. The Mac Mommy is one in a million and it was great to hear her talking about the generational and experience differences in people. I loved that she used me as an example of an old lady who still gets it! I know, she didn’t say that, but it’s actually true! I don’t remember if it came out in the interview, but she actually consults helping older folks in their homes to use their Macs and iOS devices, so she really was speaking from experience. I can’t thank Bart, Allister and Katie enough for holding down the fort and doing it up right. Honda Bob and I were chatting this week and he made a point of telling me how great all three of them did. If that’s not a seal of approval, I don’t know what is! Since the vast majority of the NosillaCast listeners will not be able to attend Macworld, I figure they’re probably getting weary already of all the chatter, so we’re going to take a break from the topic this week. We’ve told you when I’m speaking, badgered you into signing up to attend the NosillaCastaways party, and told you all the reasons you wish you could go. There is one fun thing you can do even if you can’t get to Macworld and that’s attend the NosillaCastaways party virtually. Kevin, Steve and I did some extensive testing this afternoon on how to get Google Hangouts on Air to work. With the help of participants Jean MacDonald, Kate Thomas from Wales, and my two buddies Greg Locke and Branon Peterson, we think we cracked the code on how to get people in. Rather than repeat it all verbally here though, I documented what we think you need to do over in the G+ community. You’ll need to be in there anyway to get this to work. I put a link in the shownotes to my instructions to G+ just in case you can’t find them in there. I hope you’ll give it a try and even more I hope it WORKS! Ok, enough about Macworld, let’s talk tech. While Steve and I were gone, we actually had pretty good access to the Internet, all things considered. You remember I’m sure my diatribe about how AT&T wouldn’t unlock our iPhones but then Steve pointed out we could use the Verizon Mifi with a local SIM card. As I mentioned, Allister volunteered to hook us up with the local SIM card and he came through like a champ. He got us that 3GB card for only $29. Just a BIT better than the 800MB for $120 that AT&T had offered us. It worked really well on both the North and South Islands. We didn’t want to use it all up though, so whenever we were somewhere with free wifi we’d try to use that. At Devon and Maryanne’s we went bonkers sucking up their bandwidth (luckily Maryanne did a big upgrade to super fast speeds the day before we arrived). This was really lucky timing because the 10.9.2 update for OSX for the Go To Fail bug came out while we were there, so we were all scrambling to get that update done. But when we were at hotels, things got weird. Since Donald Burr helped me create a home VPN we knew we could be safe on public wifi. But for some reason, some things on VPN just wouldn’t work. Like we couldn’t Tweet, and Steve simply could not get email on any of his accounts. I was able to get email but things would hang for a really long time and never go through, and releasing the VPN would let them go. We still tried the VPN as much as we could, and I’m sure it will give a cold chill to Bart but many times we flew without a net. When we got to Bora Bora, we had free internet in our hut, and that was the ONLY thing that didn’t cost a fortune. It was weird there too. There was a login screen to enter your room number and password, and I was hoping that meant we weren’t really on the same network as everyone else, but then I saw “Camille’s Macbook” in my left sidebar of the Finder under devices, so my wishful thinking illusion was destroyed. We didn’t even TRY to use the VPN there though, because the speed was equivalent to dial up but not nearly as stable! I’m not even joking, we were measuring 50KB/s down, 12-15KB/sec up. know, you’re trying to have sympathy for me here and it’s not working. But at least we gained a real appreciation for what kinds of problems people run into with bad internets! I was trying to edit my Clarify document on how to manage bandwidth when I ran into a problem. I’ve mentioned before that you can choose to save your Clarify documents inside Evernote, but I never realized that it does that by pushing it up to the cloud first, not to your local copy inside Evernote. I asked the Clarify boys about that, and Trevor explained that they used to store locally to Evernote but that the Evernote folks changed the interface and broke it and it was too hard to keep changing their end so they made it go to the server first. Not exactly what I wanted, but I understood the problem. It wasn’t catastrophic of course, because I could just save the Clarify document locally and then upload to Evernote later. We had HUGE problems with email in Bora Bora. These caused even more discovery of how things work. 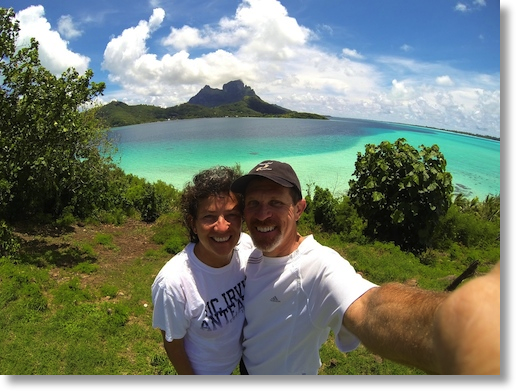 Steve and I love to take vacations and go outside and play and have these amazing adventures, like when we swam with Stingrays in Bora Bora. The second best part of these vacations is sending obnoxious emails back to our friends to irritate them, showing pictures of our wild adventures. I write a travelogue every day of our trips with funny little stories and illustrated with the photos. Now imagine I’m on these weird internets. I always address the email to Steve and put everyone else on BCC. I would tell the email to send and then watch the little progress bar go crawling across the screen. Here’s the weird part, when it was maybe 80% across, Steve would receive the email! I still didn’t have proof it sent but I know it did because he’s got it. But let’s go a little bit weirder. If I quit mail at that point…the email was NOT in my sent folder. I have no idea why this was, but it was a pain in the behind because often someone else says they want a copy of the email, or I need to look at it to remember if I already told a story, and I can’t do that. If someone has an explanation on why that happened I’d sure like to know it! Here’s another email discovery. On our last morning in Bora Bora I had some down time before we went caught our flight so I spent about 45 minutes adding photos and writing up my witty monologue in an email draft I’d saved earlier. I didn’t have time to finish, so I hit Save Draft and closed my laptop. Got to the airport and I opened the laptop and looked at the draft, and NONE of my changes were there. I then remembered that I’d noticed that same little progress bar under Mail Activity saying “saving draft” so it appears that drafts are not stored locally, only in the cloud. How lame is that??? I was pretty angry. One of the saving graces was AirDrop. Not sure if you’ve used it much but it allows you to transfer things between Macs using wifi but NOT using the Internet. I’m not sure who I learned that from, I’d always assumed it was an Internet thing before that revelation. Steve took a ton of photos and so we’d both open up AirDrop in our sidebars in the Finder and he’d simply drop them on my icon and in a half second he’d have multiple megabytes of photos onto my Mac ready for inclusion in my obnoxious letter. I should mention that Steve’s photos were all taken with the GoPro Hero 3 Black edition that he bought off of Pat Dengler. He bought it for action stuff, but it’s great at still photos too, in particular Selfies. You know how you have to really struggle to get two people into an iPhone shot? Use a GoPro and you could get a dozen in without any trouble because of the super wide angle. The picture quality is fantastic on the newer GoPros too. We did use the GoPro for adventures too. When we were in Queenstown, New Zealand we decided to literally take the plunge and bungee jump. Steve got the idea that when we did it (one at a time) we should hold a GoPro in our hand to record our own reactions. The photographer there helped Steve devise a way to use one of Steve’s straps to secure it to our hand in case in the excitement we let go. The two videos are pretty funny – especially since Steve edited them down to about 30 seconds. I have to admit that I might have almost accidentally said non-Girlscout-safe word when I first fell! I included the two videos in the shownotes in case you want to watch. Steve and I like to watch movies on vacation (heck we like to watch them all the time) so he’s ripped our favorites so we can watch them on our Macs and iOS devices. We’re cute little dorks on the plane – we each queue them up on our own device and hit play at the same time so we can watch together but have our own screens. When we were in Bora Bora, we actually had a day and a half solid of rain and high winds, so we decided to watch movies in our bungalow. Now here’s the problem to be solved – the wind was so strong that it was actually really hard to hear the movie. I remembered Boom from Global Delight that I reviewed years ago, which is designed to override the volume controls on the Mac to boost your volume. I went to the Mac App store…and waited 15 minutes for that to come up on dial up speeds. I was delighted to find that the download was only 8.6MB, so it only took an hour an 15 minutes for me to download it. Seriously Then when I launched it, it required another download (I might have said another one of those non-Girlscout-safe words) but it was only 620KB so I got that real fast. Boom did the trick, we were able to hear the movies over the din of the storm. I disabled Boom later though because it does add some distortion to the audio. Great tool to have in your back pocket when you need it. It’s $7 and when you need it, you need it. I’m not sure if I ever mentioned the genesis of this trip, but it will become relevant to the next text story so let me explain. When Steve and I were on the bus to take us to the ship for Mac Mania 15 back in 2012, we met Devon and Maryanne (Devon overheard us being silly and decided they needed to be a part of that). We got on famously throughout the cruise, together with Jean MacDonald from AppCamp4Girls. We all had a blast together. Devon and Maryanne live in New Zealand but come over to the US fairly frequently so we’ve actually gotten together several times over the last year and a half and it’s been awesome every time. Steve and I have always wanted to go to New Zealand, so Maryanne suggested we use their wedding as an excuse. And that’s how the madness began. I wanted to fly on frequent flyer miles, but the airlines make it as hard as possible to accomplish. We have American miles, and Qantas flies to New Zealand, but you have to fly 14 hours to Australia first, and then backwards 5 hours to New Zealand. No deal. Eventually (with a lot of nagging by Maryanne when I tried to give up) I figured out that Air Tahiti Nui secretly takes American miles (American will never tell you this) and they fly without going backwards, but they do have a stopover. They stop in the capital of Tahiti, called Papeete. Unfortunately the flight I found we could get landed at midnight in Tahiti, and the connecting flight wasn’t until 8 am the next morning. That meant I had to book those two flights, and Steve found us a hotel in Papeete to hopefully sleep maybe 5 hours. Ok, so we’re on step one and we’ve got 2 flights and one hotel. Now our goal was to go to Wellington, but no….you can’t go straight there, that would be too easy. So our 2nd flight took us into Auckland. Once there, we moved to the domestic terminal and flew to Wellington to stay with Devon and Maryanne. Whew. 3 flights, 2 lodgings. Now they were nice enough to host us for 4 days but suggested we go to the South island for the week preceding the wedding. That was a FABULOUS recommendation, because Queenstown is one of the most awesome places we’ve ever been, but that’s not relevant here. What is relevant (and I promise there’s a tech angle here), is that to get to Queenstown from Wellington, we had to fly to Christchurch first, and then take a different plane to Queenstown. From there we stayed in the most lovely Queenstown Park Hotel. What’s our tally now? 5 flights, 3 lodgings. I should mention that in reality one of the flights was cancelled but let’s not overcomplicate this, shall we? Now to get to the wedding, we had to reverse this: Queenstown to Christchurch to Wellington – to stay in a hotel now to give Devon and Maryanne a break while they got ready for the wedding. That’s 7 flights, 4 lodgings. But the wedding wasn’t actually in Wellington, it was in Martinborough, about an hour away. Maryanne tricked some friends of hers into driving us and letting us stay with them in a cottage they’d rented. After the wedding, back to Wellington hotel and teary goodbyes. Done with New Zealand, all we had to do was fly from Wellington to Auckland and back to Papeete, bringing us to 9 flights and 7 lodgings because AGAIN we had to spend the night in Papeete. I know, darn, you poor dear having to be in Tahiti, right? But this isn’t any actual fun because we’re getting in late at night and leaving at the crack of dawn, just unpacking and packing over and again. Here’s where you don’t feel sorry for us at all, we figured we were already there in Tahiti, we might as well go to Bora Bora for a week, right? Fly to Bora Bora, stay in a hotel them (to which we arrived by boat by the way), then flew back to Papeete, and back to LA. Whew! That’s 12 flights, 1 boat, and 7 lodgings! Now why did I tell you all of this? Well because the problem to be solved is how on EARTH do you keep track of a trip like that? Not only were there a zillion moving pieces, we crossed the international dateline twice. That meant that we left NZ the day after we arrived in Tahiti! All the phone numbers and flight numbers and times…it was a mess. Steve and I started by using Google docs, doing this in a spreadsheet, but it got out of control. Then I tried mailing all the bits and bobs to Tripit – but even Tripit couldn’t handle this complexity! It simply didn’t understand the international dateline part. While I was putting this together, another significant problem was how to make sure Allison didn’t go out of her ever loving mind!!! Maryanne and Steve were both helping but I was lying awake at night buzzing with wondering how I was going to get the next piece to work. Enter Omnigraffle. I’m not going to do a full review of this tool because I’m actually a pretty minor user of it, and I think I may have tricked Allister into doing a review for us some time soon. But let me give the basics. It’s a diagramming tool that allows you to create shapes with colors and connect things with straight lines or curvy lines, and as you move the objects around, the lines stay nicely connected to the boxes. You can add curve points to make things fit just right, and you can add “magnets” to the objects so that you have sensible places on the objects to attach your arrows and lines. 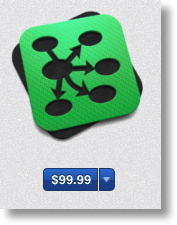 Omnigraffle isn’t cheap, it’s $100US, but it does what it does extremely well. Here’s how Omnigraffle pulled me back from the brink of insanity. I put every location in a rounded brown box. Then I drew arrowed lines between them (the arrows designating which direction we were traveling). On the lines themselves, I put the airline and flight number. Turns out if you place the text just right, it will travel along that line without falling off of it when things move around. At the beginning of each line I wrote the date and departure time, at the arrow end the date and arrival time. Ok, we’re getting somewhere. I could start to see the shape of what we’d done. Since we had several locations inside each island, I grouped those inside big boxes so I could designate north and south islands. At each location I added a yellow box in which I typed the dates and names of where we were staying. I drew a big blue vertical line showing that pesky international dateline too. Now armed with this, we could really study our reservation documents and verify that we really were leaving Auckland on the afternoon of the 11th and landing in Papeete the night of the 10th! Finally I added a grey box with all the names of the lodgings and all of the phone numbers. Speaking of the iPad, I think I did something brilliant here as well. I mentioned that Steve and I were using Google drive to manage all of this at the beginning. Well every time we got a receipt for something, we’d print that to PDF, and throw it in the Google Drive folder. Being a belt and suspenders kind of person, I also through a copy in a Dropbox folder. Then the night before we left I had an even MORE brilliant thought – I would not have Internet access while on the trip! I opened up Dropbox, and selected every document one by one and chose “open in” and selected iBooks! That meant as long as I had power, I’d have my documents. Oh, and of course we had paper copies as well. I don’t know if any of you will ever try to take on something as complex as this but if you do, I can tell you that Omnigraffle actually saved my sanity. Once I could see it all laid out, we could see what was missing, and then complete it. I actually was able to sleep at night. I know you’ll want to see this amazing diagram of doom, so of course there’s a link in the shownotes. I was also intrigued at what tech gadgets I did use, and didn’t use on a trip like this. Traveling with weird power was a challenge, so I knew I’d need my entire fleet of chargers because I’d be lucky if I got one working outlet. We brought two of those transformers that change the power from 110 to 240 volts so your stuff doesn’t blow up. We also brought adapters to change the plugs from US to New Zealand and to European for Bora Bora for the devices already rated to 240 volts like our Macs. Like most of you, I’ve become obsessed with battery packs so that I don’t have to always depend on a wall plug. We brought two Mophie juice packs for our iPhones, two standalone chargers (the Radtech and Tylt ones I reviewed recently) and my Innergie small battery pack. I was set. But guess what? If you turn off wifi, Bluetooth, and cellular, those darn devices last a REALLY long time! I think my iPad went nearly 2 weeks without a charge. I couldn’t download and watch video podcasts, wasn’t using my external Bluetooth speakers, heck, all I used it for was to show my diagram to people! The iPhones got a surprising amount of usage even with limited connectivity. We used them as cameras a fair amount, as calculators to figure convert Pacific French Francs to a dollar (around 77:1), heck we used them as compasses when we were riding bikes around Bora Bora and couldn’t figure out how far away around the island we’d gone. We sure didn’t need to charge them daily, but eventually they did need a charge. The single thing I used the most to solve that problem is called the ChargeDr from Digital Innovations. @e could easily charge our iPhones using USB from our Macs which were using up the wall plug, but Macs (and I assume other computers) have circuitry that limits how much power they’ll supply to the USB port, so you get a slow charge. This makes sense because you don’t want your USB device draining your battery. But if you’re actually plugged into power at the time, you really would want to speed this up. According to the folks at Digital Innovations, the ChargeDr allows your phone to charge at double speed, and your tablet at 4x speed. I would have thought this was a super bad idea if it wasn’t that the ChargeDr was recommended by Dave Hamilton of the Mac Geek Gab. I’ve explained how the ChargeDr works but not what the form factor is. It basically looks like a passthrough to a USB cable. You plug one in into your USB port and the other end takes your USB cable, which goes into your device. I found that the ChargeDr worked fabulously – I’m keeping it attached to my primary USB cable from now on. There’s a link in the shownotes to the ChargeDr for $23 on Amazon. One thing I figured out on travel, and Dave Hamilton tested and confirmed for me, your device will not mount as a USB device if you have it plugged in via the ChargeDr. Not a big deal, just pull off the adapter and plug it in normally. With the ChargeDr in my arsenal, I didn’t end up needing the external battery packs at all. Now that I think about it – I wonder if I can use the ChargeDr with an external battery pack to speed it up? Hmmm…must do some testing…or trick Dave Hamilton into finding out for me. I shouldn’t say that I never used any of my battery packs. I love the little tiny Innergie that I got probably 2-3 years ago. I carry it in my purse at all times along with that cool three headed cable that lets me use it for mini, micro and 30 pin – and I even added a 30 pin to 9 pin adapter to it so it does 4 kinds now. At the very tail end of the trip, we were about to board the 12th flight back to LA and we were hanging out with some friends we’d met in Bora Bora, and she sadly mentioned that she had no charge left in her phone and didn’t know how she’d call her family when she landed – so I whipped out my Innergie and again saved the day! I used one more unexpected thing on my travels – paper maps. I know it’s awesome to be able to whip out your phone and type in Starbucks and be given directions, but since we didn’t have Internet access most of the time, that wasn’t an option. Plus there’s no Starbucks on Bora Bora. But that’s actually not why I went for paper maps. Paper maps give you full situational awareness so much better than a handheld device. I wanted to know where Auckland was with respect to Wellington. I wanted to see how big the two islands were. I wanted to see the path from Queenstown to Milford Sound and why we couldn’t just go in a straight line for an hour instead of in a big loop in four hours. We were left to wander on our own in Wellington for a day, and while we’d been toured around a bit, it’s different when you’re on your own. We used a paper map to keep our bearings. I’m a huge fan of paper maps, even though that’s the most low tech thing we used on the trip! Well enough about travel gadgets, when we got back we got to spend two whole nights in our own house before traveling again – this time to the CSUN Persons With Disabilities Expo down in San Diego. I’ve talked about this conference in past years – it’s SO fun. The disabled get access to an incredible playground of wicked cool gadgets. I love the ingenuity of the developers of the software and hardware. This was the first year Steve could go with me, and we have a lot of friends who would be there. In particular Dr. Robert Carter of the Tech Doctor Podcast was going to be there and after all these years I just couldn’t miss meeting him. We did six interviews on the show floor, so I’ll play a few of them now for you and another three next week. They’re short and really interesting so I hope you like them. Chit Chat Across the Pond is a special treat – I got Dr. Carter and his co-host Allison Hartley to join me with author Shelly Brisbin to join me in a discussion of the enhancements in iOS 7.1 for the blind and visually impaired. You may think this doesn’t apply to you, but especially the low vision stuff is actually really cool for the sited, but perhaps aging population. Wait, aren’t we ALL aging? Yeah, so it’s for all of us! Kevin Murphy, PhD shows us Tack-Tiles – Lego style teaching tools for Braille. You can find them at tack-tiles.com or write to Kevin at braille@tack-tiles.com. Kirk Mills shows off Big Grips – “seriously fun protection for iPad”. Useful for those with motor control issues. You can find this case at biggrips.com and contact Kevin at kirk@biggrips.com. 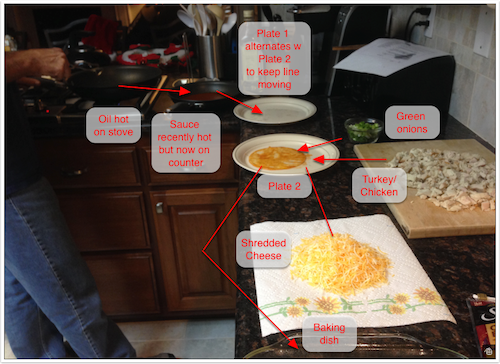 I’ve used Clarify for some inventive things but one of my recent favorites was when I documented the assembly process for my award-winning enchiladas. I’m serious, Clarify really helped me with this. See we don’t make them all that often, and every time we go to set up the assembly line, Steve and I are asking each other, “does the oil pan go on the right or the left of the enchilada sauce pan?” or “Does the cheese go above or below the green onions during assembly?” If the ingredients are laid out correctly, it’s a big giant mess of flying ingredients, but if you don’t lay them out correctly it’s a disaster of epic proportions. We made them once recently and once we got it sorted, I took a photo of the layout. The photo flew into my Mac from my iPhone with iCloud, so I was able to copy the picture from there and simply paste it into a Clarify document. Once I was in there, I was able to use the awesome annotation tools to add arrows to show the workflow, and add translucent boxes with text to explain what’s what. I know that’s not exercising 1/10th of what Clarify can do but it was so easy using Clarify. I could have used Skitch but the tools are so much more coarse and unrefined it would have looked awful! Don’t believe me? Take a look at the image in the shownotes! Head on over to Clarify-it.com and download the free Clarify 2 public beta – it’s an awesome way to test out the newest version and see if you’re ready to buy. If you do buy version 1 now, you’ll get Version 2 for free when it’s released. Shelly Brisbin – author of the forthcoming book iOS Access for All iosaccessbook.com, her blog: brisbin.net. Dr. Robert Carter from The Tech Doctor Podcast at dr-carter.com and on Twitter at @Robert_Carter and his co-host Allison Hartley at allisonfm1985. Steve sometimes gets your email before the progress bar finishes. Re Drafts folder – That’s one of the whole points of this whole IMAP thing, that folders exist out there in the cloud, so you only ever have one copy of your emails. This includes drafts and sent mails. I for one really like this. If I am looking for a mail I sent, then I could never remember from which of my over 9,000 devices I sent it from. Without IMAP I’d have to go to each device and individually search its Sent folder to find it. The same thing applies for Drafts. I can start a draft on my Mac, say, and finish it later on my iPad. Really handy. Of course the problem you are experiencing is that Mail.app implements this in kind of a dumb way; basically whenever it wants to do something that affects any of your IMAP folders (update a draft email, etc.) it immediately writes that change up to your IMAP folders in the cloud. In other words, it pretty much requires an always-on Internet connection to work. I wish it would work in a more Dropbox- or Evernote-style fashion, where you can make changes to your IMAP folders locally, then periodically sync them with your IMAP folders in the cloud whenever an internet connection becomes available. I believe that some of the other email clients (Eudora, Thunderbird, etc.) work this way, so if this really bugs the crap out of you, you might want to give them a look. Re Boom! – Here’s my solution to your problem: either (A) headphones, or (B) external speakers (be they those fancy new Bluetooth kinds, or the old fashioned ones that you plug in using an audio jack) Seriously though Boom is kinda cool, and I’m rather surprised that Apple continues to let it in the App Store, since I would be extremely surprised if they weren’t violating app sandboxing to do whatever it is they do. Unfortunately in my case I found that Boom! prevented my machines from going to sleep, so I had to uninstall it. 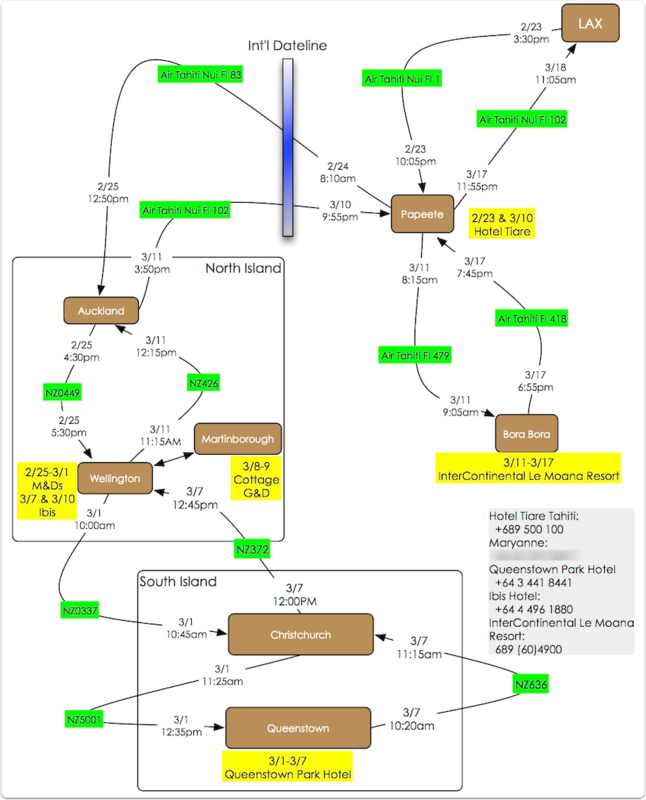 Re Omnigraffle – Omnigraffle is awesome, and I use it a lot for both business and personal stuff. I use it all the time to help describe complex software and/or hardware systems to clients and coworkers. Especially when you have several different servers on several different machines acting together, that need to coordinate with each other in a certain fashion, etc. it really comes in handy. Basically my rule for it is, if I can’t describe it in 1 or 2 sentences, I draw it in OmniGraffle. I’ve also used it to draw network diagrams for both clients as well as our own home network. I’ve also used it to draw up floor plans, which are useful when you’re trying to reorganize the furniture in a room to get things to fit, or to give to your handyman to show him exactly how you want things to be installed, etc. Donald – I get the saving sent mail to the server for IMAP is expected behavior, but I don’t see why it doesn’t save it locally first and then mirror up to the server. And if that were what was going on – how could Steve have RECEIVED the email and yet the server not have a copy of it yet in sent mail? I got notes from Barry Porter and Nick Brennan pointing me to a checkbox in preferences that sets drafts to save to the server or not! I get your point that starting an email on one device and finishing on another is a cool feature (not one I need, but still cool) but the point is to know this stuff is going on and how to control it. Had I realized it would save to the server and ERASE on my local computer, I never would have tried to write knowing I didn’t have an Internet connection! 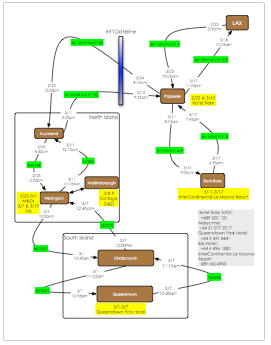 I’d really like to get better at Omnigraffle – my diagrams are crude and rudimentary so far. Glad you like it! Allison – re Dropbox and iOS. If you use the Dropbox app, you can select the star on the top right (I think), and that document is kept on your device at all times. May say a duplicate bouncing around (the one thing that annoys me about iOS file management). … but the recipients on the “Bcc:” line get a separate copy of the message containing a “Bcc:” line. (When there are multiple recipient addresses in the “Bcc:” field, some implementations actually send a separate copy of the message to each recipient with a “Bcc:” containing only the address of that particular recipient. maybe that’s what mail.app is doing, sending out different copies? Since Steve is the primary address, it get sent as a message, then all the other messages get sent. Normally you don’t notice the difference, but with the dial up speeds, well… There you go. Just my 2 cents. (Hopefully the HTML tags that I used worked).